In this modern world of cheap, mass-produced items it has become commonplace for even the venerable kitchen knife to be treated as a "throwaway product." Yet people originally believed that a kitchen knife was something that you looked after and continued to use for a very long time. Cheap knives are produced with the idea that the customer will use them for a short time and then throw them away. Even if you sharpen them, they won't cut all that much better. At Sugimoto Hamono, we have a different philosophy. We want our customers to use our products for many, many years. Our position has remained unchanged since our Company was founded. No matter how good the steel, no matter how good the blade, no matter how good the cutting technique—a knife will always lose its sharpness with use. This is exactly the same as what happens to a pencil point that becomes rounded as you use it. It doesn't make economic or practical sense to send your knife to be professionally sharpened each time it loses its edge. 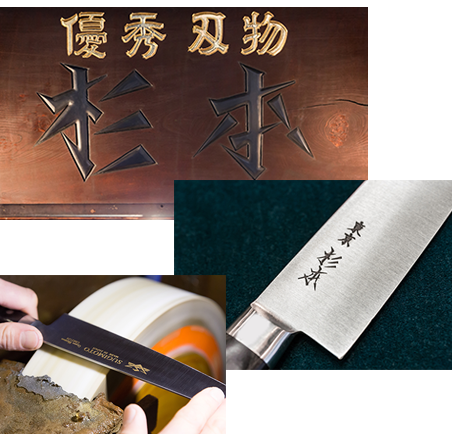 At Sugimoto Hamono we sharpen each blade by hand. If your blade loses its edge, you can simply sharpen it yourself at home, using a sharpening stone. The best way to prepare food so that you can get the most out of its nutritional value is to use a kitchen knife that cuts so well that it does not significantly destroy the cells of the ingredients that you are preparing. If you use a knife that cuts badly, you will have to use a lot of force when you cut, and this will crush the cells and allow nutrients to escape. On the other hand, if you use a kitchen knife that cuts well, the damage to the cells of the food that you are preparing will be minimized. This will enhance the appearance, taste and texture of the food. When we sharpen the blade, we remove any micro beveling on the blade edge and adjust the thickness of the cutting blade. Sharpening is an essential process, not only to make the blade easier to sharpen later on but also to get the best out of the blade's cutting ability. There is an ideal blade angle that will optimize the blade's ability to hold its edge. 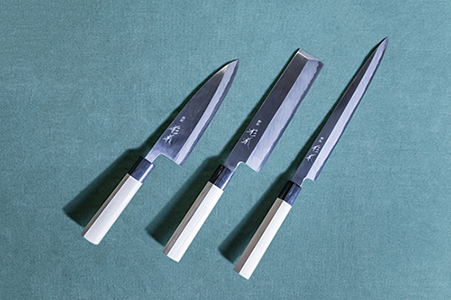 At Sugimoto Hamono, we reduce the thickness of the blade either from the front side or from the back side so that it will have the best profile to "bite into" whatever you are cutting. Although traditional samurai swords are well known, they have double-beveled blades. A knife that has a double-beveled blade bulges outwards slightly on both sides of the centerline of the knife, which distributes any forces applied to the blade, giving the blade mechanical strength. On the other hand, a double-beveled blade will not cut quite as well as a single-beveled blade. 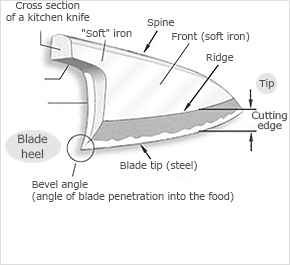 The single-beveled structure of a Japanese kitchen knife is like that of a samurai sword that has been bisected in half along its centerline. This single-beveled knife maintains the strength of a Japanese sword blade while cutting better than a Japanese sword. If you use your knife daily, it will hold its edge for about a month. 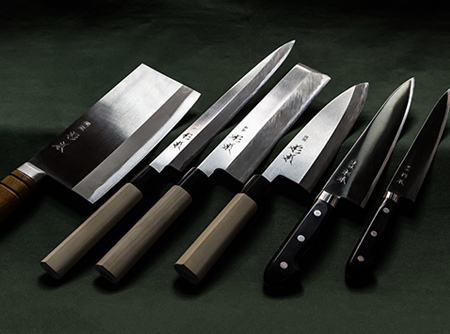 At Sugimoto Hamono we optimize the blades of the knives that our customers leave with us for servicing, so they will easily be able to sharpen their knives in future. 【Micro bevel and chisel bevel】 The blacksmith prepares a blade that has a micro bevel, to form the line of the blade. A blade in this condition is not really suitable for use in preparing food, but many kitchen knives are sold in this state. 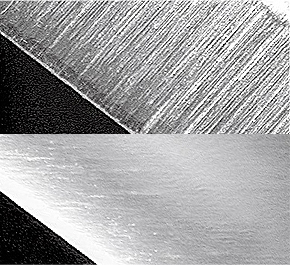 【Sharpening the blade edge】 When we sharpen the blade, we remove any micro beveling on the blade edge and adjust the thickness of the cutting blade. This process makes the knife easier for the end user to sharpen and is an essential part of enabling the blade to hold its edge. For a single-beveled blade knife to be able to maintain its cutting edge, it is important that you understand the nature of the blade and always maintain it in its proper profile. Single-bevel bladed knives can easily develop a second bevel if they are not correctly sharpened. Japanese swords are famous for the traditional samurai swords of old, and have double-beveled blades. The blade bulges out slightly from the centerline of the blade on both sides. This feature distributes the forces applied to the blade, so the blade will not cut quite as well compared with a single-beveled one. 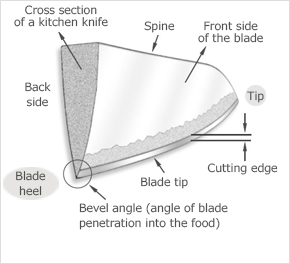 The structure of a Japanese single-bevel bladed kitchen knife is like that of a samurai sword that has been bisected in half along its centerline. This single-beveled blade cuts better than a Japanese sword while inheriting its strength. Almost all the kitchen knives that our customers leave with us for servicing still have traces of fish residue on them which have caused them to rust. After you use your knife, wash the blade and handle immediately and dry with a towel to remove any residual water. In addition, a dried knife handle easily picks up dirt, so before you use your knife, use a metal scrubbing brush to lightly scrub the handle so that it will absorb water better. Later, when you wash your knife, the handle will clean more easily, which is more hygienic. Single-beveled-blade knives cut with the back side of their blade. Please take particular care than this back side does not become rusty.